Our Club motto is “We Drive Excitement” and to the key to “driving excitement” is developing skills as a driver! We are a car club based on ownership of high performance vehicles specifically manufactured for the purpose. Our Club offers its members the below wide range of Driver Development activities because members have different cars, different interests and different skill levels, and we try to ensure that the family can be involved in most of these great driving activities. 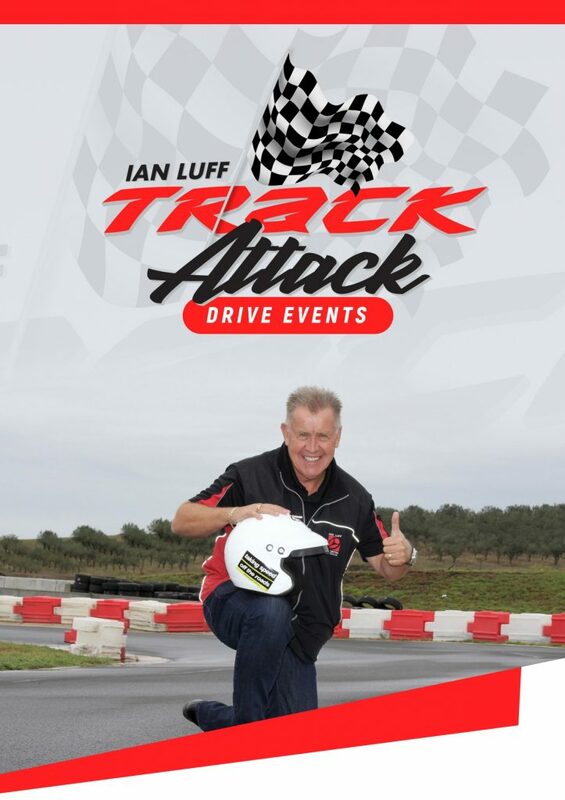 Our club works closely with the Ian Luff Motivation team who provide these specialised Driver Development programs, two of which are at special prices for Club members. Ian Luff has been a long time member and supporter of our Club, and regularly contributes driver awareness articles to our Club magazine. The Drive to Survive one day programs are suitable for any licenced driver irrespective of experience and will link classroom theory with practical hands on experience at the Ian Luff Motivation facility located at Sydney Dragway. Please click here for the dates of these two programs, and then click on the “View Detail” button within the event for more information about that specific day. To make your booking, please ring Ian Luff Motivation on 9622 5424 and tell them that you are an HSV Owners Club member to get your special pricing. Below is a more detailed overview of these two programs. The Defensive Driving program is highly recommended for drivers who have never driven on the track before and for those who want to better understand their cars dynamics on the road. They have been developed by Ian Luff Motivation Australia and are a unique opportunity to understand the dynamics of the high powered vehicles that we drive. HSV Club members receive a special price of $260.00 – $285.00 value! An interactive learning experience suitable for any licensed driver irrespective of experience. This defensive driver training program is a must for any driver, regardless of skill level (not suitable for learner drivers). In fact, 95% of all attendees who participate in this course can’t use the braking system fitted to their vehicle properly during an emergency simulation (as assessed by our staff). This is an essential lifesaving competency that we improve. After completing this training you will learn the current and best practice driving techniques that drivers should know to allow them to Drive to Survive. Key elements – ‘Driver’, ‘Vehicle’ and ‘Environment’ are broken down into individual sections linking theoretical information with practical application, demonstration, and participation. Soft plastic safety cones are used at our closed, private venues to simulate what can happen on public roads, making our exercises very safe. The program is relevant to the type vehicle you drive, large – small, sports car, commercial vehicles or four wheel drives. It will offer you the chance to learn in a safe and controlled environment in your own vehicle. Companies use the Drive to Survive program as a positive way to reduce fleet running costs, while meeting their obligations of WPH&S. Our expert team of highly experienced trainers are the best available and they have your interests ate heart. They are trained to understand that individuals require different learning strategies based on their experience level, this make’s our program a thoroughly rewarding experience for all attendees. Attitude towards driving – road rage etc..
Understanding the technology fitted to the vehicle like stability control etc.. The knowledge and skills you will gain could one day save you, or another’s life. If you lack confidence, this experience will help you develop a positive mindset to better assimilate with the busy road environment. For some drivers motoring is more about the journey, our defensive driving program provides the essential building blocks that every driver should learn. Aussie ex-Formula One driver Mark Webber kick started his career attending our Drive to Survive defensive driving program in the mid-nineties. He then went onto graduate through our next level – Performance Driver Training while working for us as a member of our personal training team. The Performance Driving program is for more experienced drivers who would like to take their car on the track. This program prepares drivers for this experience with basic performance driving skills using practical exercises on a specially designed course. HSV Club members receive a special price of $325.00 – $365.00 value! Should a driver be forced into a situation where defensive/avoidance action is required, it is essential that a level of skill is combined with correct vehicle operation taking into consideration the surrounding environment to ensure a safe outcome. These high-pressure scenarios often occur without notice, a driver with an increased understanding of vehicle dynamics, limitations and outcomes will have a better chance of accident limitation or avoidance. Be it country driving, suburban motorways or personal track driving interests, this program will enhance your ability and improve your overall driving competency. We also provide the CAMS Observed License test (OLT) to gain your circuit racing clearance at these programs. ‘Performance’ driving principles are taken to a high level at this program with driver awareness significantly increased as well as competency. The one-day (8 hour) program is conducted at a private closed venue where attendees are personally coached one on one through our exclusive (ALF) Accelerated, Learning, Formula. Our key to success is, information, instruction followed by repetition and experience. The Ian Luff personal training team are the best available anywhere and they will improve your level of performance by structured in car coaching. You get to drive your vehicle, certain vehicles types like 4WD’s or off road or commercial vehicles may be unsuitable, if uncertain please check before booking. With a low trainer to attendee ratio, and being highly interactive this allows you to step outside your comfort zone in a safe controlled environment. Developing an advanced thinking mindset, preparing you for unforeseen scenario’s where cornering dynamics are discussed and experienced (understeer and oversteer). This program is 90% hands-on where you will be consistently challenged throughout the day, vehicle dynamics are a key aspect of the program along with advanced driving principles that will make you a much more competent driver. Many attendees complete this program regularly for fun or to remain at this high level of competency. If you are uncertain whether your vehicle is suitable, please check with one of our team (bottom of this page) before making your booking. Ian Luff’s Academy Days have produced many champion drivers. Designed for you to learn about track driving from one of our expert trainers, you will have a trainer in the vehicle with you in your sessions held at Luddenham Raceway main circuit. Each lap is electronically timed, available through a simple phone App. Sessions are conducted with group number not exceeding 8 vehicles and with 15 minutes per session Trainer ratio per session is 1 – 2. This program is a lot of fun, with the added safety of a trainer with you. Sessions do include some free time for you to explore driving and what you have learned yourself. We conduct a drive off competition in the afternoon for trophies; it doesn’t depend on outright speed, but consistency, accuracy and control to give everyone a chance no matter what you drive. Academy graduates include Mark Winterbottom – Australian V8 Supercar Champion, Warren Luff – 6 times Australian Champion, 4 V8 Bathurst Supercar podiums, Mark Webber – Ian Luff Motivation Australia Academy Instructor, Formula One Driver, World Endurance Champion. 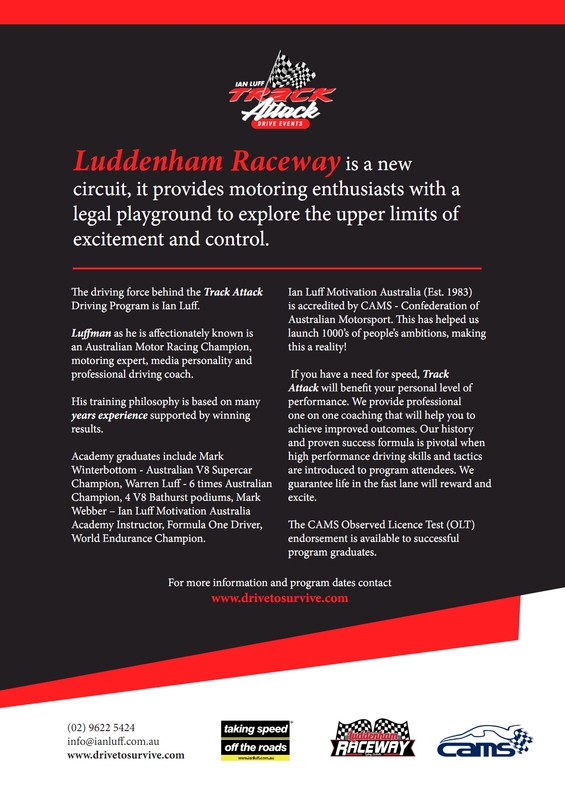 Ian Luff Motivation Australia is accredited by CAMS (Confederation of Australian Motorsport). This has helped us launch 1000’s of people’s racing ambitions, making that a reality can start right here for you. Perhaps a Bathurst podium is in your future! If you have a need for speed, Track Attack Academy Days will benefit your personal level of performance. Our history and proven success formula are pivotal when high-performance driving skills and tactics are introduced to attendees. We guarantee life in the fast lane will reward and excite. CAMS Observed Licence Test (OLT) endorsement is available to successful Academy graduates. No roll cage is required, and drifting is forbidden (venue rules). A valid drivers licence is a must (unless approved by us prior) and your vehicle must be roadworthy. Helmets are mandatory (they can be hired on the day) a passengers seat for our trainers is also required. Open track days are designed for you to enjoy the Luddenham Raceway main circuit. Please note anyone attending track days that these are private events for drivers and registered spectators. Children under 15 are not permitted in the pit area for the safety and security of all participants attending. Drive at your own pace, explore the upper limits of your vehicle. Laps are electronically timed, available through a simple phone App. You get 6 – 8, 15-minute sessions with groups not exceeding 15 vehicles (Average is 8 – 10). You can complete up to 15 laps before a cool down period, this allows you to make changes to your vehicle, rehydrate and prepare for your next session. If the number of cars running drop off towards the end of the day, it becomes an open pit lane for all groups. A second driver in a vehicle is permitted for an additional $50 fee, provided that both drivers participate in the same group with the same coloured wristband (drivers can alternate the sessions or swap mid-session for example). If the second driver wants to share a vehicle in a separate group then they must enter as a full driver and pay the full price. Passengers are also permitted and they pay just $40 per person. Registered drivers can also ride as a passenger for no additional cost. If laps are what you want, this program is for you. Priced very competitively, you won’t find a better track day option in the heart of Sydney, professionally run with a morning briefing and formatted sessions. These days are great for vehicle testing, shakedowns or for simply getting out on a track and enjoying your vehicle. No roll cage is required, and drifting is forbidden (venue rules). A valid driver’s licence is all you need and your vehicle must be roadworthy (a safety check will be enforced) vehicle registration for the road is not required, so towed race and track day vehicles are allowed. Helmets are mandatory as is neck to wrist to ankle covering. If you don’t have a helmet you can hire one for the day for $20. There’s also a café on site in the check in area where you can purchase light snacks, tea, coffee, cold drinks. Please note all spectators must be registered with the venue on the day and are required to pay a $5 fee per person, this goes to charity.